HMAS Arrow was commissioned into naval service at Hervey Bay in Queensland on 3 July 1968. She was one of twenty Attack-class patrol boats ordered for the RAN in November 1965. The Attack class was equipped with high-definition navigation radar, magnetic compasses, an echo sounder and air conditioning for service in northern Australian waters. Their primary role was to conduct patrol work in Australian territorial waters. Arrow sailed south to Sydney with a temporary crew arriving there on 11 July 1968. Following a period of defect rectification, a predominantly RAN Reserve (RANR) crew joined the ship on 15 July putting to sea three days later for work-ups. She then departed Sydney for her first homeport of Melbourne on 25 July, her departure having been delayed due to inclement weather. She arrived in Port Phillip Bay on 27 July where she became the training vessel for the Melbourne Port Division of the RANR. HMAS Arrow in her guise as a training ship for the Melbourne Port Division of the RANR. 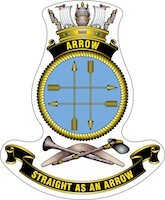 Arrow served in that capacity for the next six years providing training to rotating RANR crews for two weeks at a time, primarily along the Australian east coast, and in Victorian and Tasmanian waters. This was in addition to regular weekend training and ‘day-runs’. She participated in Exercises RED NED and RECOUP in February and November 1969 respectively, and underwent a refit at Cockatoo Island Dockyard from April to June 1970. On 27 February 1971, Arrow visited Devonport in Tasmania to act as flagship for the annual Devonport Regatta on 1 March. Three years later she attended the Launceston Regatta in February 1974 before sailing to Sydney for a major refit. HMAS Arrow in 1974 shortly before her move to Darwin. On 30 July 1974, Arrow’s time as a RANR training vessel came to an end and she resumed duties with the RAN fleet based at HMAS Waterhen in Sydney. Following a busy period of work-up and trials, she departed Sydney on 21 August for her new home-port of Darwin where she joined the Third Australian Patrol Boat Squadron. She arrived in Darwin on 2 September. Her first operational tasking was to conduct a hydrographic survey of Cone Bay and Collier Bay in north eastern Western Australia. She arrived back in Darwin on 9 October. She sailed again for her first Fishery Surveillance Patrol off the Western Australian coast on 23 October and maintained a regular patrol and maintenance program up until what would prove to be a fateful Christmas period. Left: Darwin in the aftermath of Cyclone Tracy. Right: The pontoon and tug used to remove Arrow from the seabed under Stokes Hill Wharf and tow her to Frances Bay. On 21 December 1974 the United States weather satellite SR8 detected a brewing storm over the Timor Sea. By 22:00 that evening the storm had officially been upgraded to a cyclone and assigned the name ‘Tracy’. Over the course of the next three days, Tracy wound its way south-west and around the west coast of Melville Island, ravaging Melville and Bathurst Islands in the process. She then wound back to the south east and headed straight for Darwin. Tracy struck the Northern Territory capital in the early hours of Christmas Day with winds reaching nearly 260 kph, the highest wind speed ever recorded at ground level on the Australian mainland at that time. Tracy claimed the lives of 49 people ashore and a further 16 at sea. As Tracy approached Darwin on the 24th the sailors of the patrol boat force were recalled from leave. Married members were instructed to assist their families prepare for the cyclone and then return on board in time to sail. The intention was for the four patrol boats to ride out the cyclone either at the moorings or at anchor in the harbour, and Arrow indeed had secured to furthermost south-east buoy by 1830 that evening. By dusk, all of the patrol boats had been secured to their respective commanding officers’ satisfaction. As the clock passed midnight into the morning of Christmas Day, Arrow’s commanding officer, Lieutenant Robert Dagworthy, RAN, felt his ship was riding the storm well. Some 20 vessels were shown on radar astern of Arrow in the harbour at midnight. Over the following hour to 0100, the weather deteriorated and Lieutenant Dagworthy felt that the cyclone was closer than had been predicted. The weather continued to deteriorate to 0200 and the number of vessels visible on radar had noticeably decreased. By this time the rain and sea spray were driving horizontally and the visibility was virtually nil. The wave height could not be estimated due to the poor visibility. In spite of the conditions, Arrow was riding the storm fairly well but there was some concern that the shackle used to secure to the buoy might part. Meanwhile it was noticed that the other three patrol boats had all disappeared and it was thought that they had gotten underway having dragged. By 0230 it was hoped that conditions were starting to improve; however, at 0245, Lieutenant Dagworthy was informed that the gypsy on the mooring winch had failed and the ship was no longer secured to the buoy. Arrow’s main engines were started with the intention of riding out the rest of the cyclone where she was. She was turned into the wind with satisfactory results but occasional wind gusts caused the ship to roll violently. It was only with outstanding ship handling that Arrow was able to maintain her heading. Conditions worsened yet again after 0300 and sometime between 0330 and 0345, the starboard engine alarm sounded and it was ordered to neutral. The engine had lost circulating water suction and its temperature was reading 215°C. It could be used if it was essential, but only for short periods. Lieutenant Dagworthy was aware that both engine circulating pumps took their suction from the same manifold and felt that it was only a matter of time before the port engine would suffer the same problem. He favoured the port engine thereafter by necessity, but he assessed that the ship could not survive indefinitely on one engine. The ship was being pushed westward and Lieutenant Dagworthy decided to beach Arrow in Frances Bay where there was plenty of mud, no rocks and some measure of protection. His only concern by this stage was the safety of his crew and, if possible, to minimise the damage to his ship. All spare hands were ordered to the Flying Bridge with lifejackets partially inflated. With the starboard engine overheating it was decided to use the port engine to turn the ship to starboard but it was not long before the port engine alarm also sounded. It too was overheating but with the safety of the ship and her crew now in peril, the throttle was not altered. With the ship turning to starboard, Stokes Hill Wharf unexpectedly became visible ahead and a collision was unavoidable. Just before 0400, Arrow struck Stokes Hill Wharf bow first and ‘abandon ship’ was ordered. Apart from the few crew members closed up in the wheelhouse, the ship’s company had mustered on the Flying Bridge. The Executive Officer, Sub-lieutenant John Jacobi, searched along the ship’s port side for the safest escape route but, in attempting to reach the wharf, fell into the sea. He was washed ashore below the wharf gatekeeper’s hut. Most of the rest of the crew scrambled on to the wharf by climbing onto the funnel casing, then on to the portside guardrail and on to the wharf safety rail. In addition to Sub-lieutenant Jacobi, three others, including Lieutenant Dagworthy, ended up in the sea either by choice or misfortune but were eventually washed ashore. Those that escaped onto the wharf became separated in the poor conditions but were later reunited ashore where they sought shelter after getting off the wharf. Several suffered various injuries from flying debris. Tragically two crew members, Petty Officer Leslie Catton and Able Seaman Ian Rennie, lost their lives as Arrow was wrecked under the wharf. In the confusion their movements following the order to abandon ship are unclear but at some stage, both fell into the water and drowned. It appears that at least Petty Officer Catton made it onto the wharf but was either blown off by the strong wind or was knocked off by flying debris. A Board of Inquiry was convened to investigate the loss of HMAS Arrow and the damage to the other patrol boats. In Arrow’s case, the Board stated in its report; “The orderly action of the ship’s company and the mutual assistance given in the prevailing conditions, firstly to reach the wharf and subsequently to leave the wharf area, can only be regarded as most commendable. Having regard to the position of the ship and the conditions this was obviously a major factor in the majority of the ship’s company reaching safety.” Able Seaman Robert McLeod was awarded the Australian Bravery Medal on 16 September 1977 for assisting injured shipmates. Clearance Diving Team One successfully refloated Arrow on 13 January 1975 by attaching pontoons to her hull and using tugs to pull her clear of the wharf at high tide. She was towed underwater to shallow water at Frances Bay where she was surveyed, written off and later sold to a local businessman whose intention was to rebuild her as a museum piece. The restoration process proved too expensive and Arrow was eventually broken up where she lay. Petty Officer Catton and Able Seaman Rennie are commemorated at HMAS Coonawarra with a plaque and the inclusion of their names in a stained glass window at the base’s chapel, and the Arrow Bar at the base is named in the vessel’s honour. Arrow Drive, Catton Court and Rennie Road are all also named in their honour. Left: The wreck of HMAS Arrow at Frances bay. Middle: The wreck of HMAS Arrow at Frances bay - Bow. Right: The wreck of HMAS Arrow at Frances bay - Port. Left: The wreck of HMAS Arrow at Frances bay - Stbd. Middle: The wreck of HMAS Arrow at Frances bay - Stern. Right: The wreck of HMAS Arrow.